I am a summer girl. I love long days and sunshine. I love planting and growing and walking barefoot and trips to the beach. I love the smell of grass and warm pine needles. I love flip flops and shorts. And sitting out by the blooming mint watching dozens of bees get their fill. And taking walks in the evening. Everything about summer, I love. Even the heat (well, as long as it doesn’t get TOOOOO hot). And then comes fall. It’s not that I don’t like fall. It’s beautiful. And smells good. But it’s a bitter sweet thing because it signals the end of summer with the impending doom of winter is just around the corner. When I’m tempted to get down about fall though, all I have to do is think of pumpkins. Then, magically, all is right with the world again. Right now I’m in the middle of frantic last minute packing, trying to juggle all my work around jillions of last minute details. I feel stretched in way too many directions. 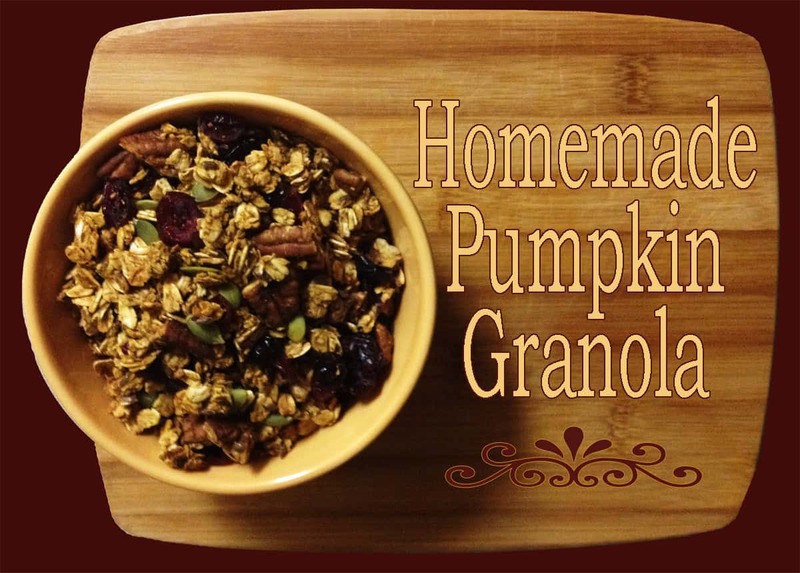 Yet, when my aunt texted me to say that she came across a pumpkin granola recipe, I stopped everything, scoured the mostly empty (because they’re already mostly packed) cupboards and did a happy dance that all the ingredients I needed were yet to be taped up into boxes. 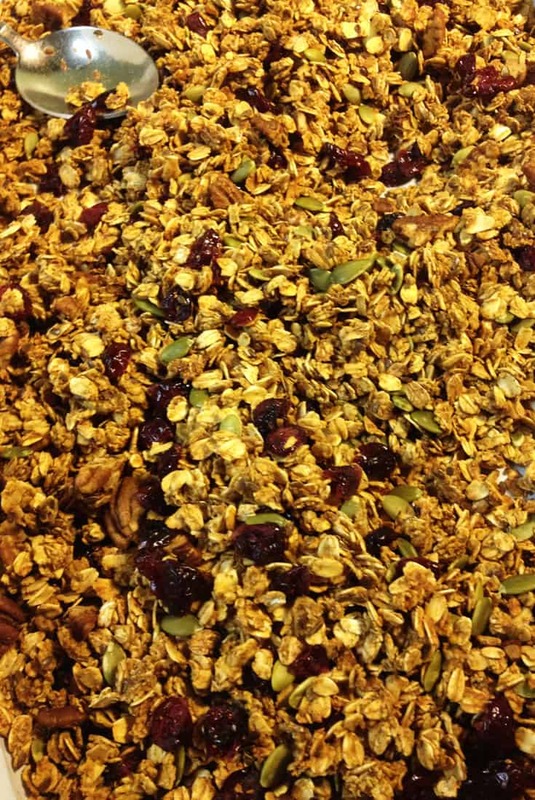 Mix the oats, spices, nuts and seeds together in one bowl (but not the cranberries). Mix the wet ingredients together in another, until smooth. Add the two together. Mix until the dry ingredients are coated with the wet ingredients. Spread on a parchment lined cookie sheet and put in a pre-heated 325 degree oven. Bake for 30-45minutes, stirring after each 10 minutes. It’s done when it gets crunchy (it will get more crunchy when it cools, so be careful not to overcook it). Pull it out of the oven and stir the cranberries in. It smells so good you won’t be able to resist it. Just warning you. And it tastes great warm, too. But I like it better cold. By the handful. Yes, I guess I might survive fall after all.